Title: Electromagnetic extraction of energy from Kerr black holes. 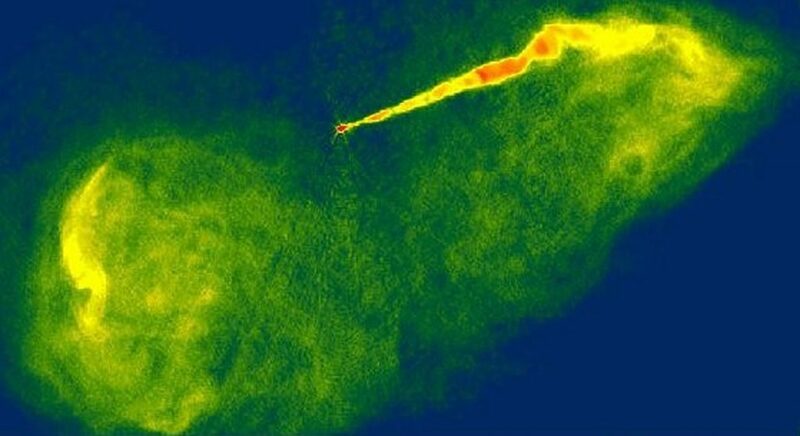 What we’re seeing is a called a jet, viewed from a radio telescope, in a distant galaxy. That little bright dot at the center is a black hole, millions of times the mass of our sun. The thin line across the image traces out the path of plasma (superheated charged particles) streaming away from the black hole. In the corners we see where that plasma starts to cool, and slow, spreading out in great wings of expanding gas. For scale, you could fit our entire galaxy onto this image with space to spare. It might look a little dim however, as this jet is pouring out roughly 4 times more light than the entire Milky Way. In fact there is a galaxy in the image, which the black hole sits at the centre of, but it’s almost invisibly faint. The first jets of this scale were discovered almost a hundred years ago, but even today we struggle to explain how such a monumental amount of energy is generated and channeled into this piercingly narrow beam. Roger Blandford and Roman Znajek, nearly fifty years ago, outlined the mechanism most widely accepted today, to power and confine the jet. That said it remains one of astronomy’s largest open questions, each theory with it’s own uncertainties and advantages. It’s a window into one of the universes most extreme and poorly understood environments: the super-hot, dense and turbulent inflow of material into a super-massive black hole. To explain their theory we’ll need three parts. A way to confine the outflow, a way to power it, and a force to actually push the material out at relativistic speeds. Magnetic fields are incredible things, acting on all kinds of different scales. The earth’s magnetic field looks like a bar magnet, the kind you probably remember trying endlessly to squish together in science lessons. Field lines extend from the south pole to the north in wide arcing curves, then carry on through the centre of the planet to rejoin and form an continuous loop. In fact, all magnetic fields exist in these unbroken curves. It’s a fundamental theorem of physics that gaps, kinks and dangling loose ends of the fields can’t exist. Earth’s magnetic field, from supercomputer simulations by Los Alamos National Laboratory. The spherical bulge in the middle is our planet, and whilst in reality the fields in the centre are a tangled mess, each is part of a continuous, closed loop. Field lines are tied to the material they pass through. This means as that material, like planets or clouds of gas, move that they’re dragged along with it. This is well demonstrated by this scientifically relevant and mathematically rigorous picture of an otter. 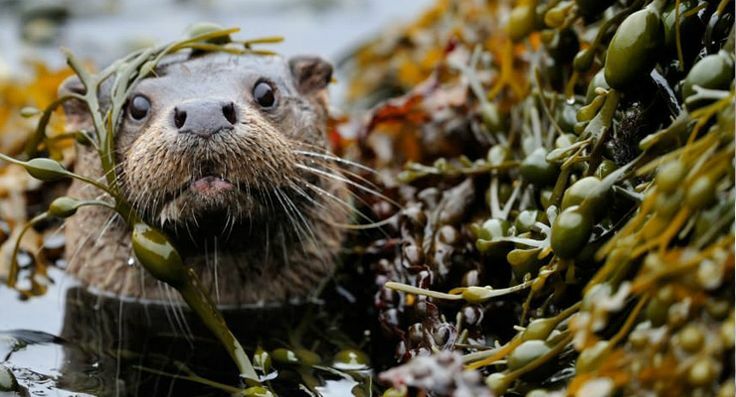 As this otter, draped with seaweed, moves around the tendrils she’s tangled up in will unfurl, stretch and trail him. This is why the magnetic field in the above picture of the earth is so tangled, as molten material moving under the crust churns up and twists around the field lines. This also means that forces acting on magnetic fields must also act on the material they’re threaded through. To return to our lutrinean researcher, as the otter swims the seaweed drags through the water, pulling her back. But magnetic fields experience some forces that seaweed doesn’t. If you try and force a huge amount of seaweed into a small area all you have is a terrible salad. Do the same to magnetic field lines and they’ll push back against you. They resist bunching, bending and twisting. They do their best to return to their most stable state, straight, uniform and sparsely spaced. Thus areas with a high density of field lines will experience a pressure, pushing charged and magnetized material away from it. You might be thinking that this sounds like a good way to create the forces needed to power a jet, and you’d be right, although I’m going to ask you to stop thinking of it because I’m going to get to that later and kind of wanted it to be a surprise. Before then there’s one last rather incredible and important property of magnetic fields to show you. As a charged particle moves in a magnetic field, it feels a force at right angles to the direction it’s traveling. This turning force leads it to loop around and around as it travels, tracing out circular paths. 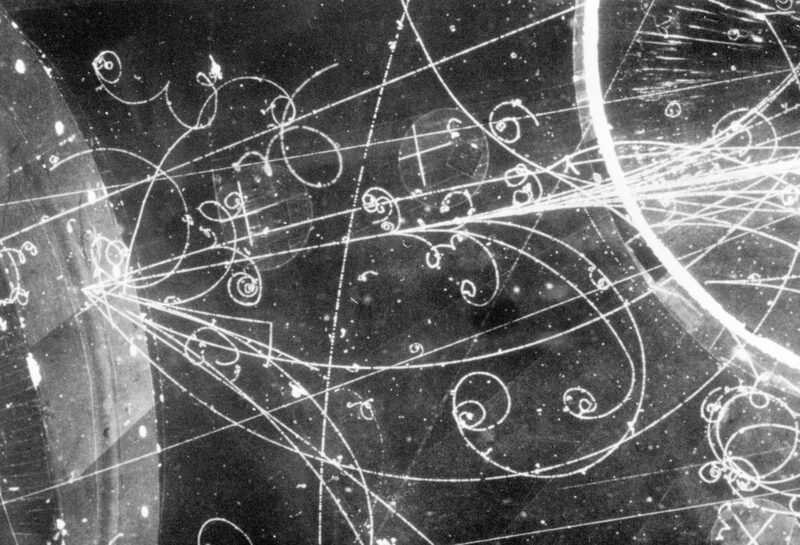 A bubble chamber. Particles are fired through a superheated liquid, bubbles are formed as they pass through, tracing out their motion. As they move through a magnetic field we see their spiraling paths. This means charged particles must keep looping around magnetic field lines, unable to stray away from the field. 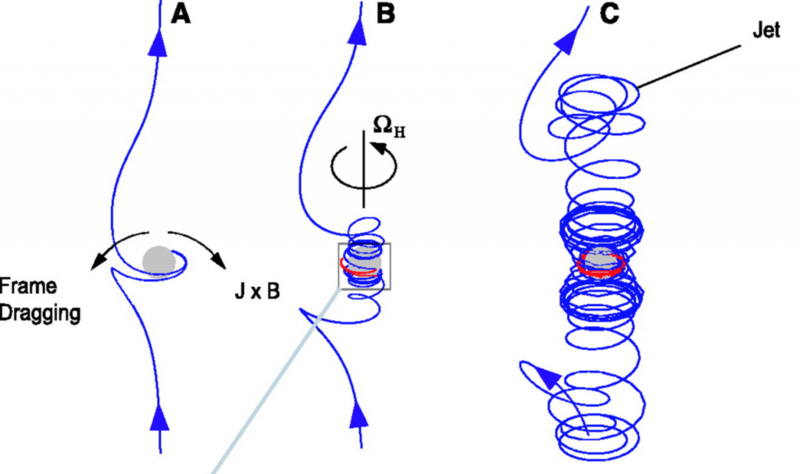 Much like a bead on a string, charged particles are confined to travel along field lines. So if the field lines follow a narrow path away from the black hole, the outflowing material must do so as well. We have a path for the jetted material to follow, along magnetic field lines. Now we need a source for the energy to send them flying out at such high speeds. At the same time we need to ensure that the fields themselves are in a narrow column that will give us piercing outflow we observe. Both these problems can be explained by the inflow of material towards the black hole. 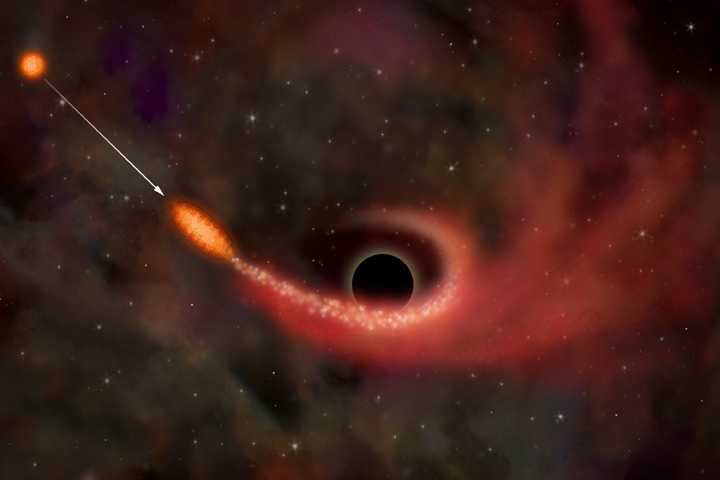 Super massive black holes feed mostly on clouds of gas, slowing winding their way in towards the center of the galaxy. These clouds are threaded with magnetic fields, and settle into a disc as they wick their way inwards. This disk is very dense, and only gets denser the closer to the black hole material gets, meaning there’s a huge amount of field lines in a small area. These field lines will try and straighten and unbunch themselves, eventually rearranging until they’re at right angles with the disk. 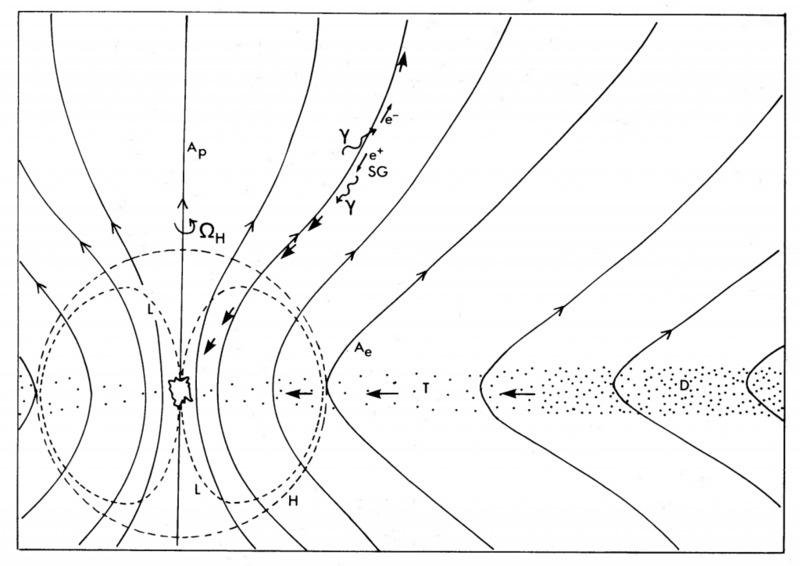 From the original paper, here we see the accretion disk (D) and as gas flows in towards the black hole’s event horizon (H) the magnetic fields (solid black lines) straighten. Top middle, electrons and positrons stream away from each other along the magnetic field lines. All this inflowing gas also brings with it a lot of energy. Enough to power the huge amount of light being emitted from the jet and the accretion disk, dwarfing the rest of the galaxies light. For gas to creep closer and closer to the event horizon it must lose energy and slow down, and lot’s of this energy goes into heating up the disk, but some of the rest will be the power source for our incredibly energetic jet. We have the power source, we have the track along which the plasma will fly, now we just need the force. Remember earlier when I asked you to stop thinking about how field lines bunched together will try and force themselves apart? Well now I want you to stop stopping thinking about it, because it’s about to be very important. The centre of the disk, and maybe the black hole itself, are spinning incredibly fast. As material threaded with magnetic fields rotates around the black hole it’s field lines start to be coil up. The field tries to resist this bunching, but so much mass is spiraling in so quickly, with so much energy, that it’s impossible to stop it twisting and tangling. As part of the field line, blue, is spun around the central object, it starts to bunch and coil up. This leads to regions of huge magnetic pressure just above and below the black hole. Image courtesy of V. Semanov, S. Dyadechkin & B. Punsley, 2004. Where the coiling is tightest and the bunch of field lines the most extreme, at the poles, the magnetic pressure builds up. This pressure is large enough to force plasma away, along the column shaped magnetic field lines, at speeds near that of light, and with energy rivaling that of an entire galaxy of stars. And this is the jet we see, that beautiful straight line in the first image, coming from this tangled mess in the last. Magnetic and gravitational forces combine in the extreme environment at the fringes of a super massive black hole to power a phenomenon that dwarfs the distant galaxies where we observe it. There are still many unanswered questions regarding jets. Only a small fraction of super massive black holes seem to display them. To really understand what’s going on in the vicinity of such massive objects stretches our understanding of general relativity. There’s even debate about whether our own galaxy once housed a jet, and whether huge bubbles of hot gas above and below our galaxy were blown out there by jets, or whether there are whole other processes at play we’re yet to understand. So, once again, to not waste any further words, I invite you to wonder at another incredible image of this fantastical astrophysical phenomenon. Jet from the M87 galaxy. It appears to only emit on one side, but this is because it’s pointed almost directly at us. This mean plasma flowing towards us appears blue shifted, to higher energies, making it much more visible, than the jet flowing away. Image courtesy of ESA/Hubble. Did any of you people ever look at what you get when you use that “WordPress Blog” button? Cannot even tell it is from astrobites. Get rid of that button and just add a standard reblog button and that problem will go away.